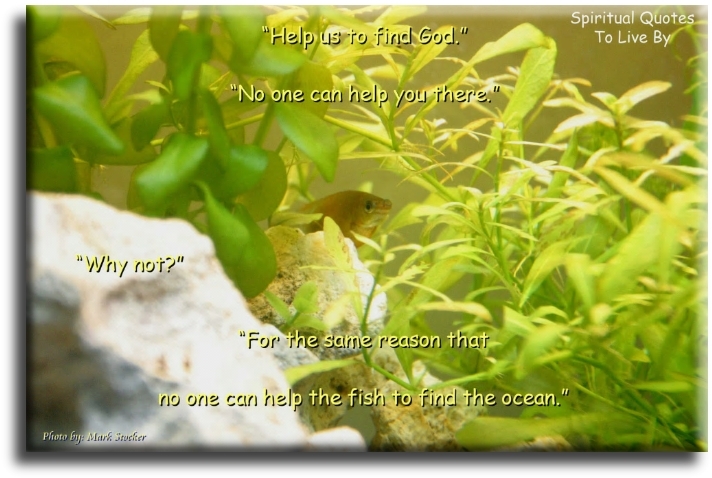 "Help Us To Find God"
No One Can Help The Fish To Find The Ocean." A wonderful quote and one I also believe. Also, this was another instance of Law of Attraction working in my life, picking up that particular book of his and immediately finding that quote which was a longer version of the one I was using. Once there was a man who was a firm believer in God. One day it began to rain very heavily. It kept raining and a big flood came. The man climbed up onto the roof of his house, and knew that he would be OK. God would protect him. A boat came by and the guy in the boat said: "Hey, jump in, we will take you with us." "No thanks", said the man. "I'm a firm believer in God. He will rescue me". He sent the boat away. Another boat came by and the guy in this boat said, "You look like you could use some help. Jump in and we will take you with us." "No," said the man. "I'm a firm believer in God. He will rescue me. Don't worry about me." So the boat sailed away. A helicopter came by and the guy in the helicopter threw down a rope and said, "Hi there my friend. Climb up. We will rescue you." "No," said the man. "I'm a firm believer in God. He will rescue me. I know he will." The helicopter flew away. It kept on raining, and raining, and finally the man drowned. When he died, he went to Heaven, where he was met by God. The man asked, "Where were you? I waited and waited. I was sure you would rescue me, as I have been a firm believer all my life, and have only done good to others. So where were you when I needed you?" God looked at the man and answered, "I tried to rescue you. I sent you two boats and a helicopter..."
Thanks to Nick Ortner of The Tapping Solution for sharing this. 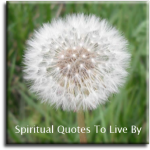 Another relevant verse was one I wrote based on quotes from the book "Conversations With God" by Neale Donald Walsh.